It’s easy to find malaria maps of Peru, as well as general information about malaria in Peru, but not all sources, including recognized medical authorities, necessarily agree precisely with each other. Ideally, you should obtain information by visiting your doctor and by reading reliable and authoritative websites, in order to get a more rounded picture of the situation. Malaria maps from your doctor and from online resources illustrate the transmission areas in certain countries, as you can see from the Centers for Disease Control (CDC) map above (click here for larger PDF version). 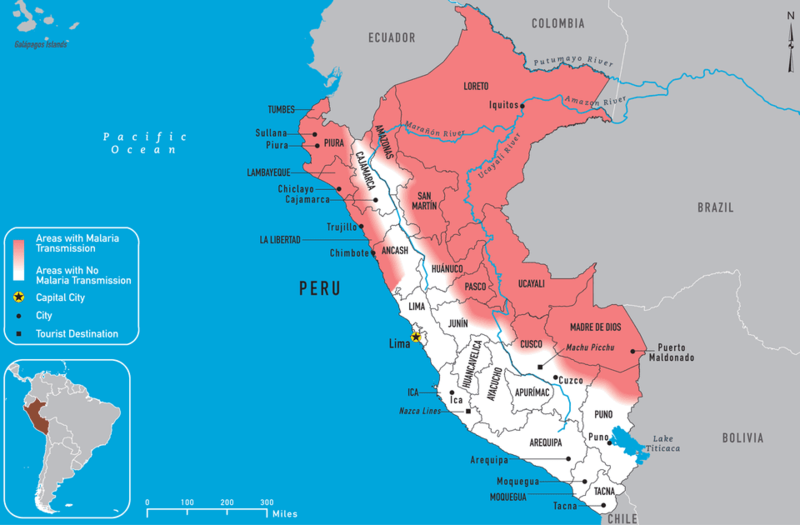 In this particular malaria map of Peru, you can see that the principal malaria transmission areas in Peru are located in the jungle regions east of the Andes mountain range. There is a smaller transmission zone along the north coast of Peru, stretching from the Tumbes department along the border with Ecuador, all the way down through the western half of the Ancash department. This CDC map is a broad visual reference highlighting areas that could carry a risk of malaria transmission. It's a good overall indicator, but doesn't provide much detail. The NHS fitfortravel malaria map of Peru offers slightly more detail than the CDC map thanks to the inclusion of a third category (“Variable Risk,” in which antimalarials are normally advised). This map clearly shows that the most consistently high-risk area in Peru is in the northeast, primarily in the Loreto department. On the coast, meanwhile, the area of variable risk stretches from Chiclayo north to the Ecuadorian border (on the CDC map, the coastal “area with malaria transmission” stretches from the border all the way down through coastal Ancash). The central and southern jungle regions are also categorized as variable risk. As with the CDC map, this kind of visual data is designed to compliment written information and advice from your doctor. The fitfortravel website states that the map "must always be used in conjunction with the malaria advice text." The map above is from the Dirección General de Epidemiología of the Ministerio de Salud del Perú (Peru’s Ministry of Health; see original PDF map and report). As you can immediately see, this map offers much more detail than the CDC malaria map. Of course, the map above is for one specific year (in this case, 2013), whereas the CDC map is a more general illustration that has to account for ongoing shifts in malaria transmission patterns within the country. What the Ministry of Health map shows, however, is the great variance in actual transmission frequencies within potential malaria zones. Here we can see that certain sections of the Loreto department in the northeast of Peru (see departments map) are considered to be very high risk for malaria (the areas on the map are defined as follows: red--very high risk; pink--high risk; yellow--medium risk; green--low risk; white--no risk). As another example, the San Martín department appears almost risk-free apart from some small pockets of low and medium risk. On the CDC malaria map, the whole San Martín region is marked as a malaria transmission area. This is true: you could get malaria in San Martín. But the likelihood is not as great as in, for example, the rural jungle areas of Loreto. In the first half of 2014, there were 19,694 confirmed cases of malaria in the Loreto department and only 168 in San Martín. According to the figures from Peru’s Dirección General de Epidemiología, not one of these cases was fatal.